Step and Repeat Banners is rated 4.7 out of 5 by 9. Make sure your events look swanky and hip with step and repeat banners. Step and repeat banner printing is an inexpensive way to set the tone of your event while showcasing your company. Your brand is front and center because one or multiple logos are printed on them in a repeating pattern. If you have an important fundraiser, press release, fashion show, or red carpet event, this is the perfect backdrop for you and your guests to take pictures. Highlight your logo and company name to boost your brand’s presence. With step and repeat banners, you can capture precious moments while looking dazzling in all the event photos. Premium 15 oz. vinyl features a smooth matte finish that shows your logo without the glare. This heavy-duty material is tear and mold-resistant and lasts up to 5 years outdoors. Standard 13 oz. vinyl is a durable and waterproof material that has more texture than premium vinyl substrate. Great for both indoor and outdoor use. 13 oz. poly film comes in a bright white front with a glossy, very smooth finish. It features a gray back so it’s more opaque even in bright lighting. Since it is waterproof, it can be used both indoors and outdoors too. Selecting the perfect size for your event is the first order of the day. You want a banner that is tall and wide enough to keep the edges from showing up in the photos but still fit the venue. 10’ x 8’ is the popular choice because it is the widest size so a large group can fit in one photo. This is the best option for large outdoor events since there is more space available. 8’ x 8’ is suitable for taking photos of small groups. Two or three logos can fit this size. 8’ x 5’ is ideal for events with limited space or only photos of an individual or pair will be taken such as photo booths. This size can fit one or two logos perfectly. Tip: You also need to consider the size of the logo you will use on the banner. Make sure they are small enough to fit in the frame regardless of how many people are being photographed. A good size is 9-11 inches wide and 5-7 inches tall. This will still show up clearly in photographs. 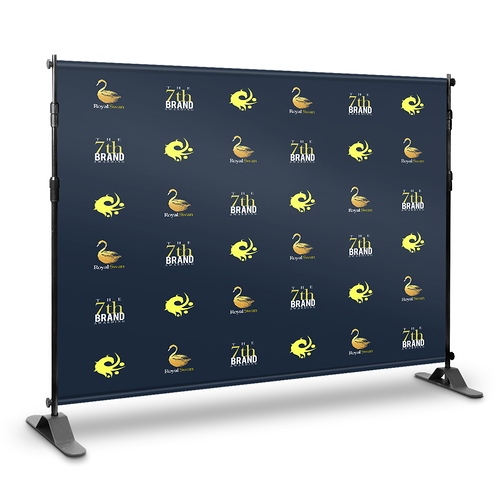 You can order your custom printed step and repeat banner by itself or get it with the optional telescoping stand. This adjustable stand is portable, lightweight, and comes with a carrying bag for easy storage. Grommets – Add this if you need to use twist ties to attach your banner to a stand or the wall. These are located at the top and bottom of the printed banner. Hemming – This finish prevents the banner material from fraying. Pole Pockets – This is made by folding the banner edges to create a hole where you can insert the telescopic poles in to hold the banner in place. Step by Step. Then Repeat. 1. Join the top horizontal telescopic poles together tightly before adjusting the connecting poles to the same length. 2. Fasten the bases to the vertical pole using the screws provided. 3. Extend the poles to make them the same height and lock them in place. 4. Adjust the poles so they are just past the banner length. Insert the top horizontal pole through the pole pocket. 5. Use the screw knobs to attach the top horizontal poles to the vertical poles. 6. Unroll the banner and insert the bottom horizontal poles in it. 7. Secure the bottom horizontal poles to the bottom of the vertical poles. 8. Check if the bases are secured to the poles before lifting the banner and stand. Tip: Tighten the telescopic poles as needed to make the banner and stand taut. Make sure you don’t over tighten or it will be difficult to disassemble. Read this article to learn more about step and repeat banners. Be sure to check us out frequently for incredible discounts for your step and repeat banner printing. How many grommet holes are made for step and repeat banners? Grommet holes are placed every 2 feet along the horizontal edges of your banner. Please note that we don’t offer side grommets. This is dependent on your “printing turnaround time”. This is the number of days we need to produce your custom step and repeat banner printing. Holidays, weekends, and the shipping transit time is not included. Can I have my artwork printed on the front and back of the banner? Yes, you can have your artwork printed on just one side or both sides of the banner. Rated 5 out of 5 by ctine from Fast, easy & great quality We needed super-fast turn-around on our banner, and were very pleased with the easy & speed of the process! Rated 3 out of 5 by Will from No instructions for mounting the banner. The printing was fine but there was no way to mount the banner to the stand and I somehow accidentally ordered the banner without the stand. My fault but website maybe could have been a little more explicit on things. Rated 5 out of 5 by Ijpcats from Great copy I bought this for my daughter sweet 15 (Quinceañera party). It was based on her theme (Aladdin’s Cave of Wonders). and off of a painting. The staff at 48hourprint were very helpful throughout the process and the backdrop was absolutely beautiful. Everyone had praises for the backdrop. Rated 5 out of 5 by trigs from Quick and good value The banner artwork is nice and crisp. It's good quality and nice sturdy stands. Very quick turnaround. Thanks!